The big picture here is of God providing blessing and answering [of] prayer [to] God's people for these individuals. This is partly in response of the president's and administration's commitment to push back against that which is evil, the North Korea regime and everything they're doing, and commit to help those who are being persecuted for their faith, not just in North Korea but elsewhere around the globe. The three men are expected to arrive in Washington, DC by 2 a.m. Thursday. Kim Dong Chul is the longest-known U.S. detainee in North Korea, having spent at least 900 days in custody. He is a South Korean-born U.S. businessman and pastor arrested in October 2015. His arrest stemmed from an allegation that he was trying to meet with a former North Korean soldier to receive classified information. North Korea said he was colluding with the South Korean spy agency, which denied being involved with Kim. He was sentenced in April 2016 to 10 years of hard labor. The two other detainees, Kim Hak Song and Tony Kim, worked at the Pyongyang University of Science and Technology. They were detained in 2017 and charged with "hostile acts" against the North Korean state. Kim's family issued a statement through their lawyer, Randall Brandt, after his release was made public. Click here and scroll to read some of the tweets from various Christian leaders. The move brought praises from around the globe, but especially within the Christian community. Some commented on U.S. President Donald Trump's firm hand toward the dictatorship while others acknowledged the need for more assistance around the globe. What many may not know is that 2000 pastors gathered in Seoul, South Korea January 1-5, 2018 at our annual HIM conference . The speakers were Bill Johnson, Chuck Pierce, Lou Engle and myself. Lou gave a passionate message urging the Korean pastors to go on a 40-day fast and pray for the North and South Korea unification and the end of the war. Keep in mind, in January things were very tense between Kim Jung Un and President Trump. Hundreds of pastors made a commitment to pray and fast for 40 days starting sometime after the conference. We noticed a dramatic shift of Kim Jung Un and his policy towards the South Koreans and the USA near the end of that 40 day period. I know millions of Christians in South Korea have been praying since 1953 but I can't help but believe that what we see taking place in North Korea is the result of the specific call to prayer and fasting that took place this past January. The president's comments in the Rose Garden last Thursday on day of prayer, specifically commented publicly about the plague of persecuted Christians around the world, and [how we should] attempt to help them. I think we are witnessing God answering a commitment to use the sort of government described in Romans 13, to praise and protect those who do well, and expose and do what is possible to bring to punishment those who do evil. Open Doors celebrates the release of American prisoners Kim Dong Chul, Kim Hak-song and Kim Sang Duk, also known as Tony Kim. This certainly marks a great victory for these families and one critical step toward restoring diplomatic relations with North Korea. To keep progressing, this first gesture of goodwill must now be followed by further actions to address the long-running, systematic human rights abuses that still plague the people of North Korea. Building on this positive development, we must continue to advocate for the release of political and ideological prisoners among the estimated 250,000 North Koreans in Kim Jong Un's prison system. We must continue to call attention to the 50,000 Christians who have been detained in these interrogation centers, prison cells and work camps. And we must continue to work toward religious freedoms for the estimated 300,000 North Korean Christians who must practice their faith under threat of harassment, imprisonment and even death. The logical next step is for the Trump administration to press Kim Jong Un to open his labor camps to the Red Cross and the United Nations Council of Inquiry within the next 30 days. We must gain transparency into how these people are being treated. And then we must push forward to negotiate with North Korea to release all political dissidents being held across their prison system. We must make it clear that Kim Jong Un can only be invited back into the world's good graces, and be lauded for political gestures, if he commits to resolving decades of human rights violations at the hands of his regime. This man maintains fascist control over North Korea, leading his country to be ranked No. 1 on the Open Doors World Watch List for 17 consecutive years. Beyond those whom Kim imprisons, he systematically brainwashes and isolates all of his citizens from outside information, and he demands cultic reverence for himself and his ancestors. While the freedom of three American prisoners is a fantastic start, let's acknowledge that Kim has not yet ushered in freedom for all. 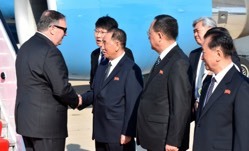 Don't let these recent positive developments be perceived as the celebratory end of the freedom work in North Korea, and instead let it mark the beginning. As an American, I wholeheartedly applaud the Trump administration for working tirelessly on bringing home the three detained Americans from North Korean, and more broadly President Trump's role in helping create a genuine opportunity for peace on the Korean peninsula. This is truly an historic day and one that bodes well for the prospect of peace throughout all of Asia. As a Christian, I rejoice knowing full well that the proclamation of the Gospel in North Korea has been clandestine in nature for decades. Many brothers and sisters in Christ have risked their lives in doing so and at least one of those released was detained because of his faith. Where the South has flourished economically and spiritually, the north has languished under communist stagnation and state-sponsored atheism and shamanism. I believe today marks a prophetic shift in the future of the North Korean people as well as for the Gospel spreading among them, just as it did in the south. The release of these hostages should be cause for celebration for all Americans, especially Christians who have been praying for the release of pastor Tony Kim. Yet we cannot forget that there are still countless people still suffering inside North Korea. For example, tens of thousands of North Korean Christians have been locked up and sentenced to forced labor simply because of their faith. This news should encourage us to continue praying for a true peace and freedom for everyone in North Korea.